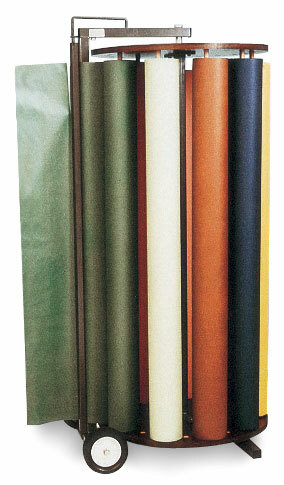 Loaded with 10 rolls of Art Kraft paper of assorted colors, 48" wide × 200 ft long. Spring-loaded cutter bar holds paper in place. Weighs 210 lb. Ships unassembled. Rotary Rack Dispenser with Paper — Colors included are White, Flame Red, Canary Yellow, Orange, Light Green, Emerald Green, Bright Blue, Dark Blue, Black, and Pink.